While the first half of October was fairly warm, the weather models have been suggesting a shift to more seasonal temperatures as we hit mid-month. 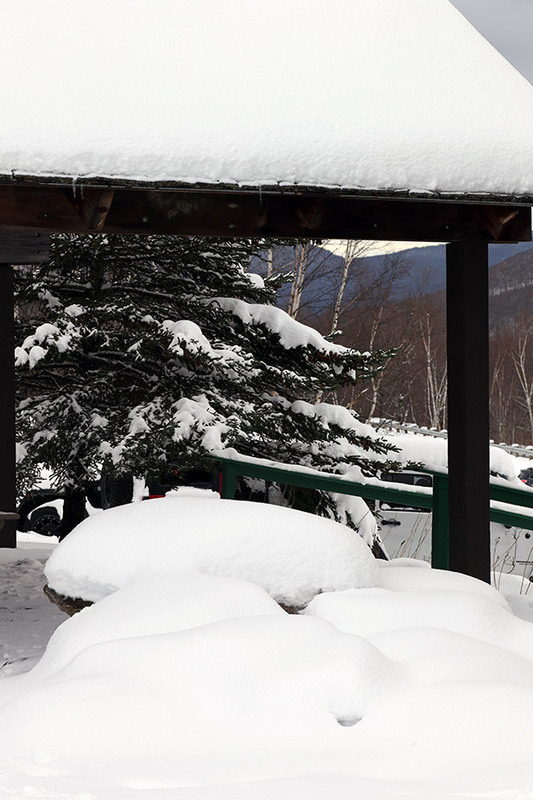 The potential for some mountain snow was in the forecast last night, and indeed as of yesterday afternoon snow was already being reported at Whiteface Mountain across the lake with video of the flakes. 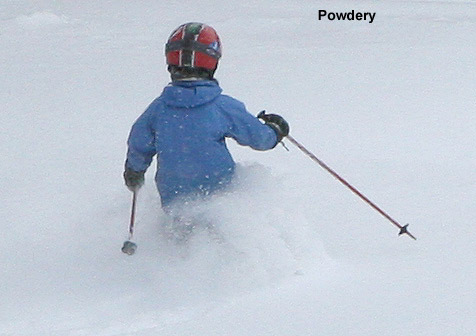 Here on our side of the lake, we heard from Powderfreak early this morning that snow had been sighted in the mountains around Stowe, and he was heading up for some investigation. An hour or two later, he had send along pictures, and indicated that accumulations on Mt. Mansfield were about a half inch and started at an elevation of roughly 2,300 feet. Here at our house, I did a morning check to find that the cloud ceiling was still only about 2,000 feet and there were no obvious signs of snow below that level. I gave the clouds some time to think about clearing a bit, and then headed out in the neighborhood during the mid-afternoon period to see what snow might be visible. 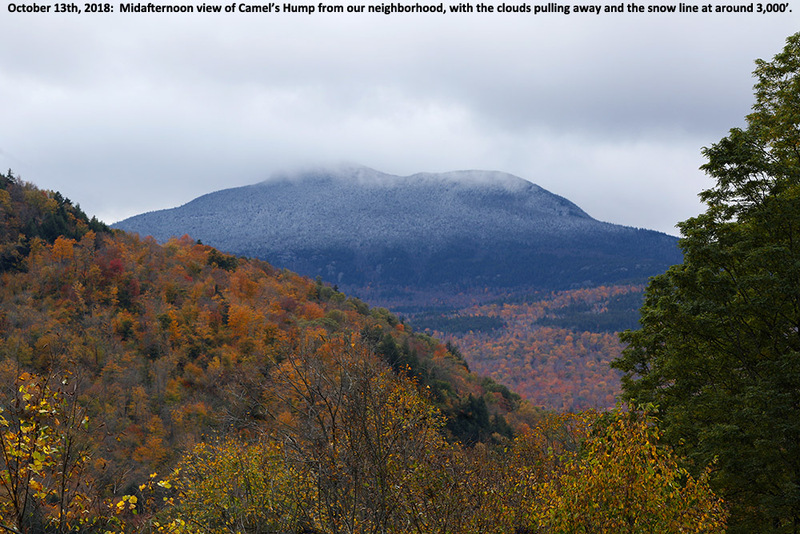 Indeed the cloud ceiling had risen by about another 2,000’ and I was able to catch Camel’s Hump as the clouds had just about broken away. 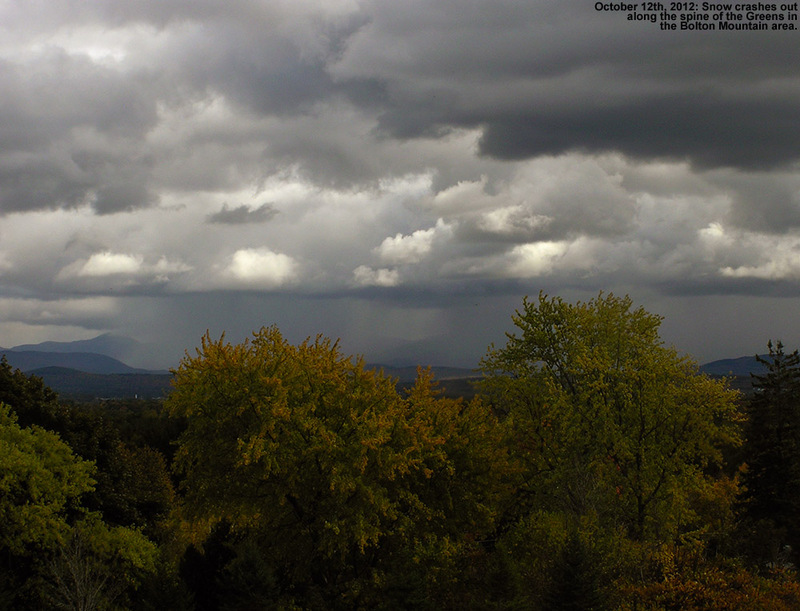 The snow line at that point looked to be around 3,000’. The first snows of the 2018-2019 winter season are in the books here in the Greens, and the National Weather Service Office in Burlington says it looks like we’ll have more opportunities for snow this week with accumulations potentially even down to the mountain valleys. We’ll see what transpires as even colder air moves in, so stayed tuned for more October snow updates! It’s been a light week for snowfall here in the Northern Greens; since the storm that hit the area last Sunday, we’ve had generally cold and dry weather, with just one small round of snow in the Tuesday-Wednesday timeframe. 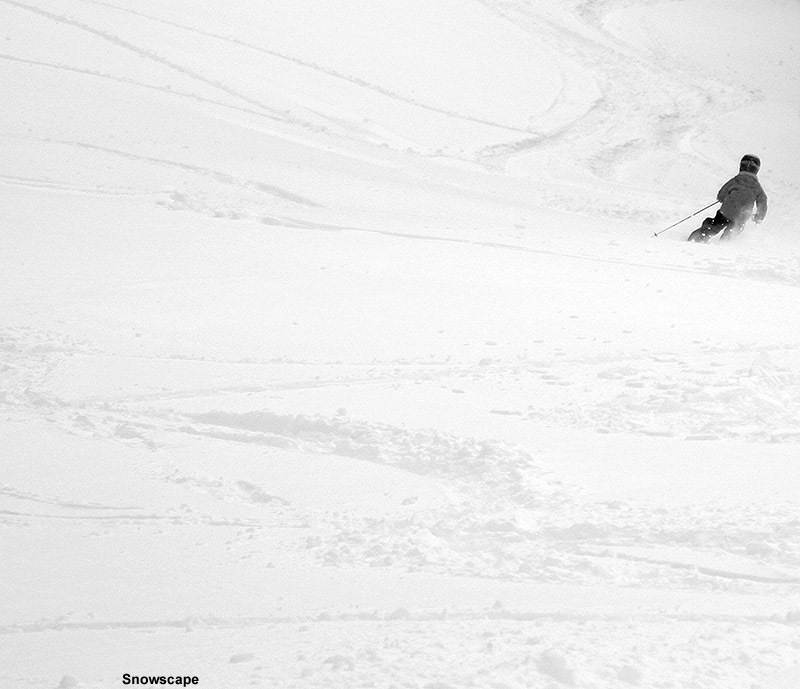 That got me thinking about a backcountry tour for today. 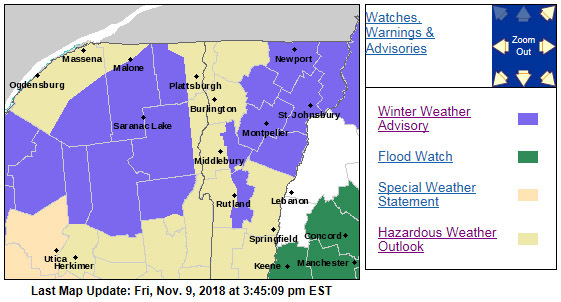 My initial inclination was to head northward, since as our snowy Sunday outing at Stowe confirmed, the northern mountains had really picked up the most snow, and accumulations tapered off as you headed southward. 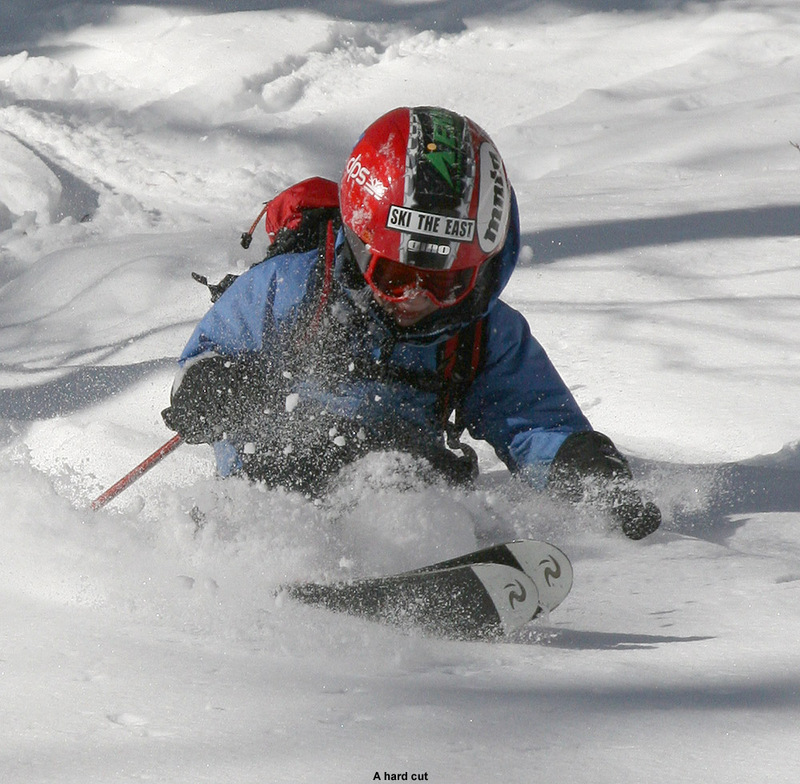 With that in mind, I was thinking of heading to Nebraska Notch for some turns. However, yesterday’s and today’s weather history also needed to be factored into the mix. Temperatures reached above freezing in some spots yesterday, and today was looking similar, so I figured that something sheltered and with relatively high elevation was the way to go for the best snow. 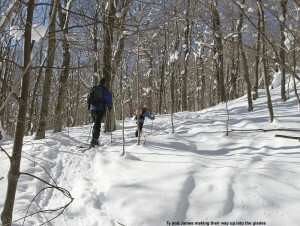 I decided to head to some of the skiing around the Monroe Trail, on the Waterbury/Duxbury side of Camel’s Hump. I had planned to have Ty come with me, but at the last moment he decided that he didn’t want to skin today, so I said we’d head up to Bolton Valley for some lift-served turns when I got back from the tour. 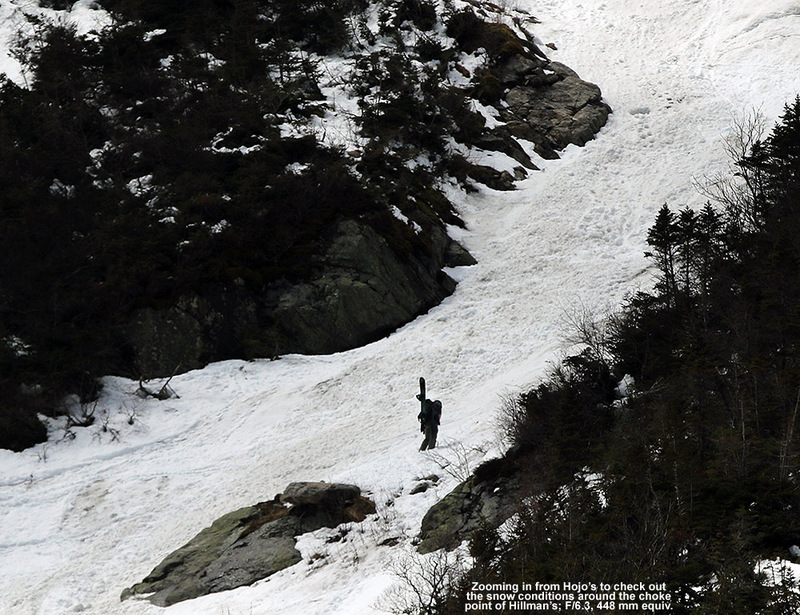 It’s been over four years since I last visited the Monroe Trail area of Camel’s Hump for skiing. 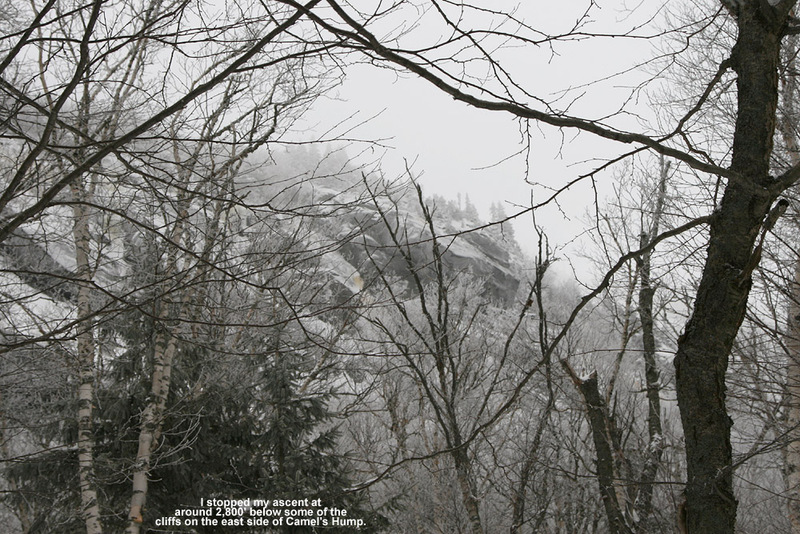 On that outing, I followed the Monroe Trail up to the large cliffs beneath the peak of Camel’s Hump, then traversed somewhat northward to set up for a descent fairly distant from the trail and toward the glades that drop down near the trailhead. 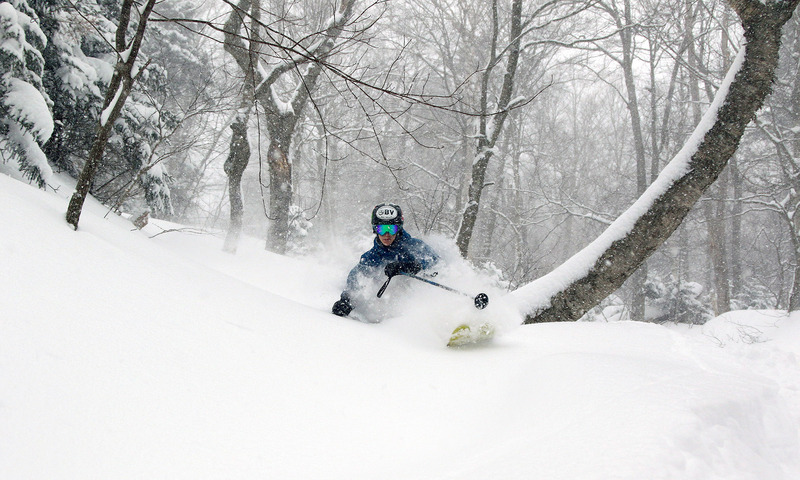 I got in some good skiing in the trees, but really just caught the end of the glades, so I knew there would be more lines to explore. 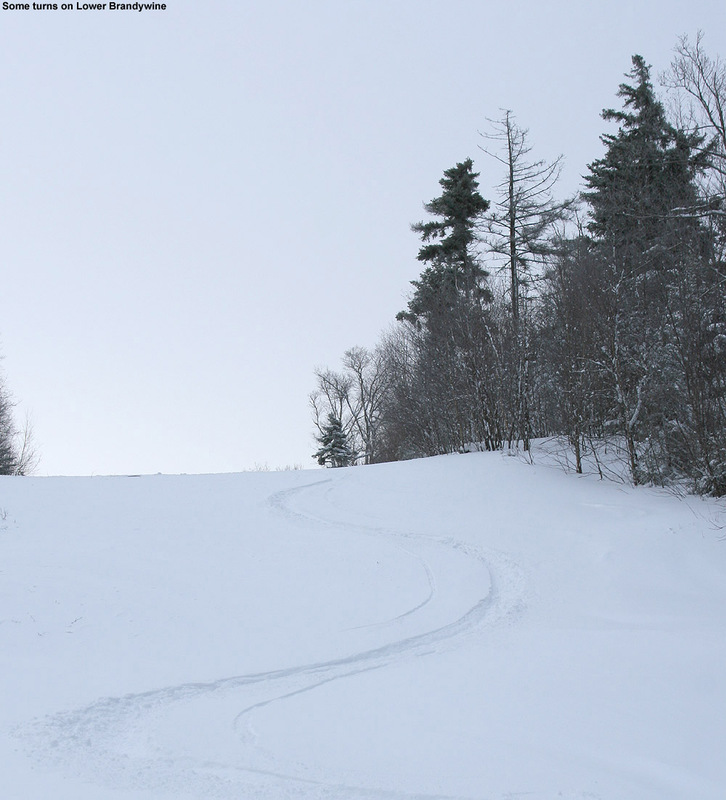 This time, my plan was to simply skin up one of the descent tracks made by skiers coming down through the glades, since it would save a lot of time traversing around up high to find the best starting points. I headed out from the house a bit before noon, and temperatures were in the mid 30s F. The temperature fell as I headed up Camel’s Hump Road, dropping to 31 F by the time I reached the winter parking area at ~1,200’. Just a couple hundred feet below the parking area, I’d seen the first flakes of snow from a small system that was expected to come through in the afternoon. 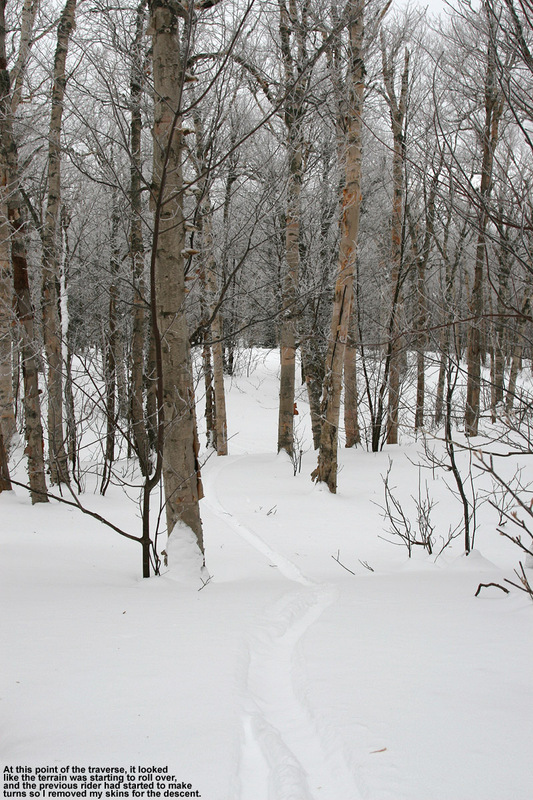 From the trailhead at ~1,500’, I skinned up the Monroe Trail for a few more minutes and then as the trail started to bend southward, I jumped onto one of the ski tracks coming down out of the obvious glades in the terrain above. The tracks traversed northward for a bit, but then gradually began to make a more direct ascent up toward the east face of Camel’s Hump. I was a little worried about the snow quality, because although it was below freezing and most snow that wasn’t in the sun was still wintry and dry, there were only a few inches of powder above an old crust. 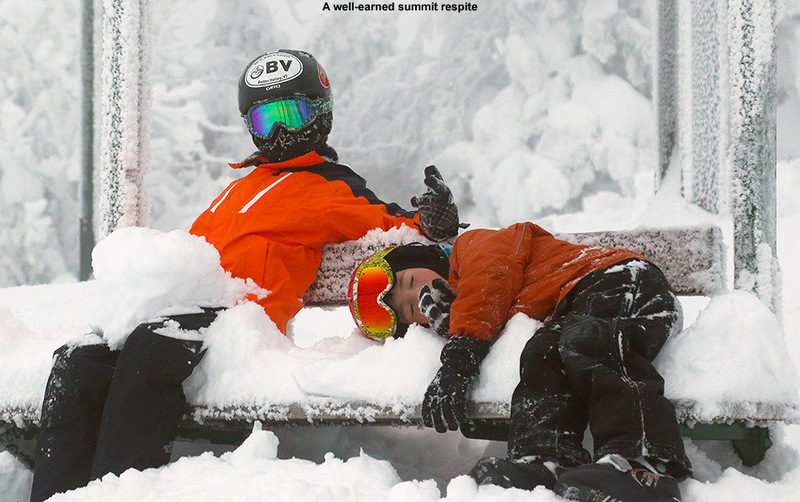 I wasn’t quite sure how that was going to ski. 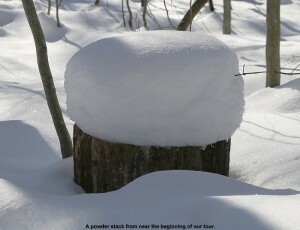 But, the snow got better and better as I ascended, with the powder on top of any crust getting deeper and deeper. It was really nice skinning though – the temperatures were just below freezing, the wind was calm, and light snow was falling in association with the afternoon’s storm. I hiked in just a vest over my polypropylene base layer, and quickly had my hat off as well. 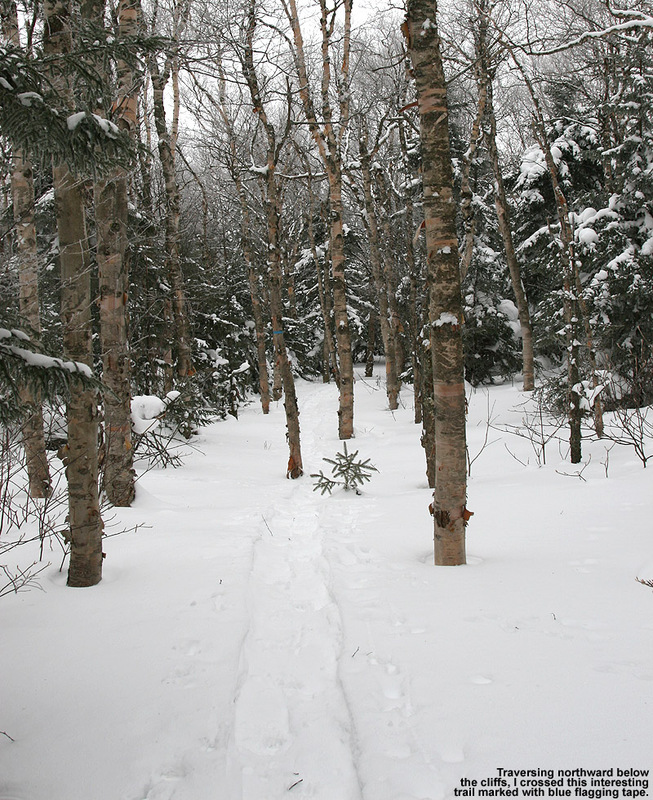 As I ascended, it became obvious that the lower parts of the glades represented a common track to regain the Monroe Trail, but in the higher elevations, there were a number of interconnected glades from which to choose. 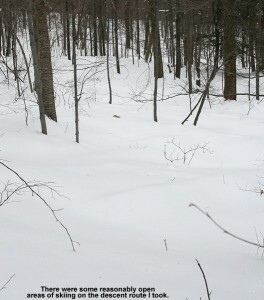 About halfway through the ascent, I stuck with a glade that was generally on the skier’s right of the area that had seen very little traffic. 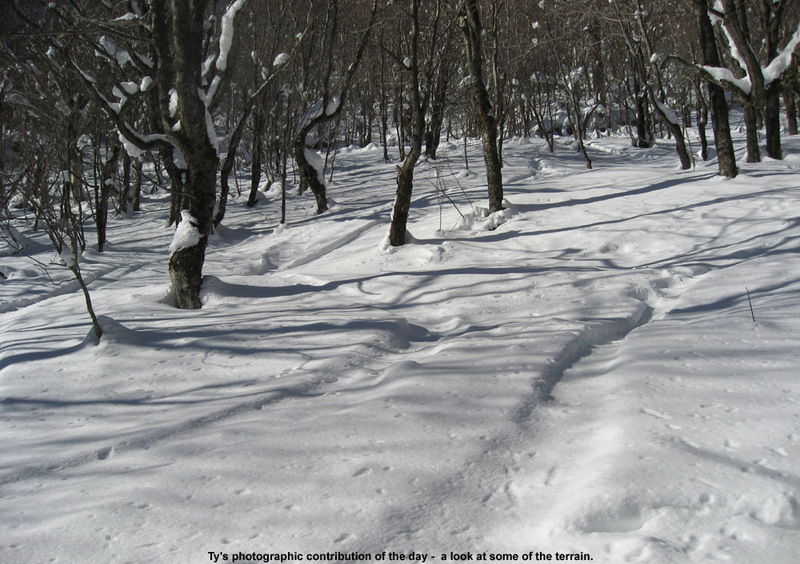 There was just one very old descent track in it, and that track was actually hard to find at times because so much snow had fallen on it since it had been made. 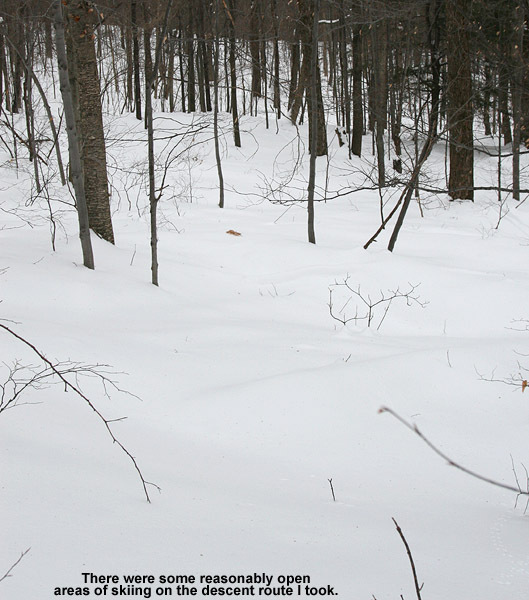 I knew that there were other glades around to my north, because I saw a couple of skiers descending in that area. After generally rejoining with tracks from some of the other glades, I traveled for a bit through more gently sloped terrain until I hit the trail for the Camel’s Hump Challenge at roughly 2,800’. I followed that northward a bit more until I topped out around the 3,000’ mark in some of the upper glades just below the Cliffs of Camel’s Hump. 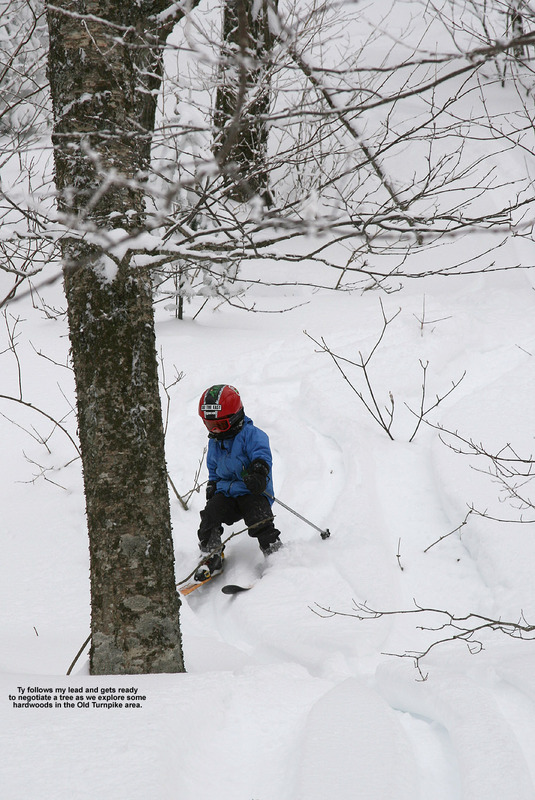 The quality of the snow had definitely improved up at that elevation, with any crust buried below several inches of powder. I had a snack, switched my gear over, and then began my descent. There were some decent turns above the Camel’s Hump Challenge Trail, but the best turns were definitely when I got onto that lesser used glade below that point. The highest quality snow was in the top half of the vertical, and with my fat skis it was generally soft, bottomless turns. On the lower half of the descent, even my fat skis weren’t enough to always keep me floating, as the depth of the powder decreased to just a few inches; to best handle any partially tracked and/or narrower sections of terrain, I had to inject a lot more alpine turns into the mix vs. just Telemark turns. 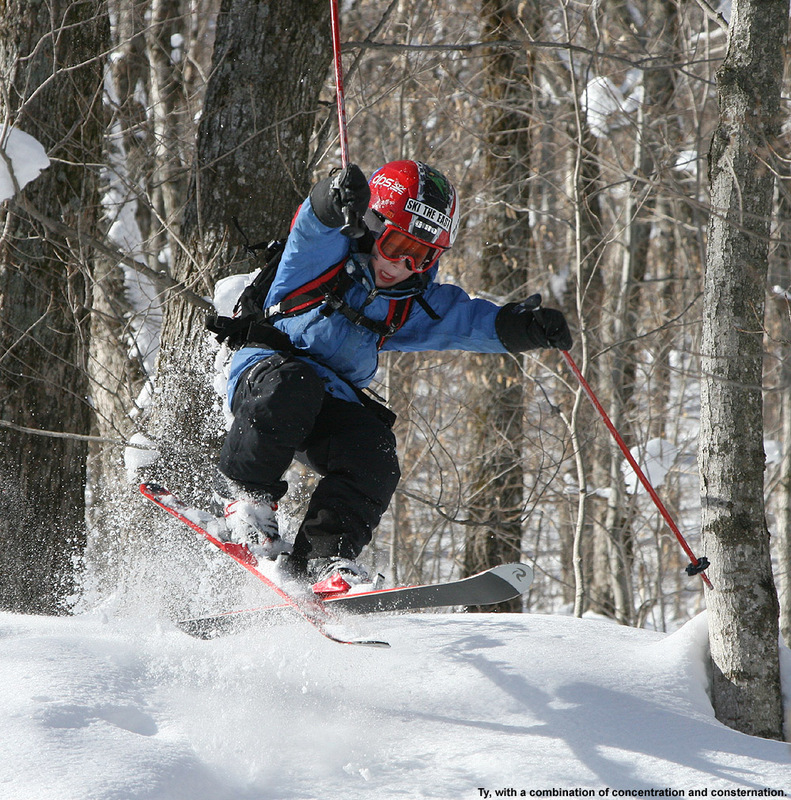 I did venture off the main glade that I was on at times, and there was plenty of skiing to be had right in the natural trees all around. 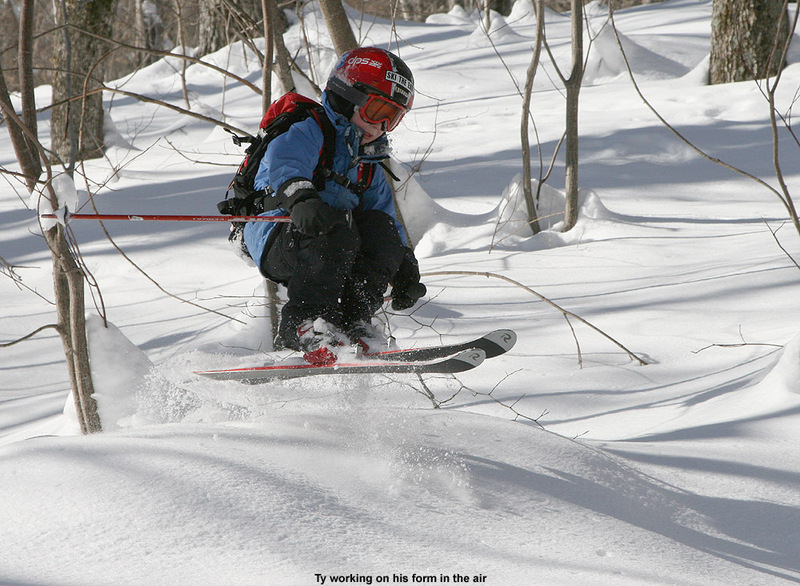 I saw one other skier as I was descending – he was ascending through the glades as I’d done. He and his dog moved out of the way when he saw me off in the trees beyond the glade, but after I let him know that I was solo and nobody else would be coming down behind me, he quickly resumed his ascent. 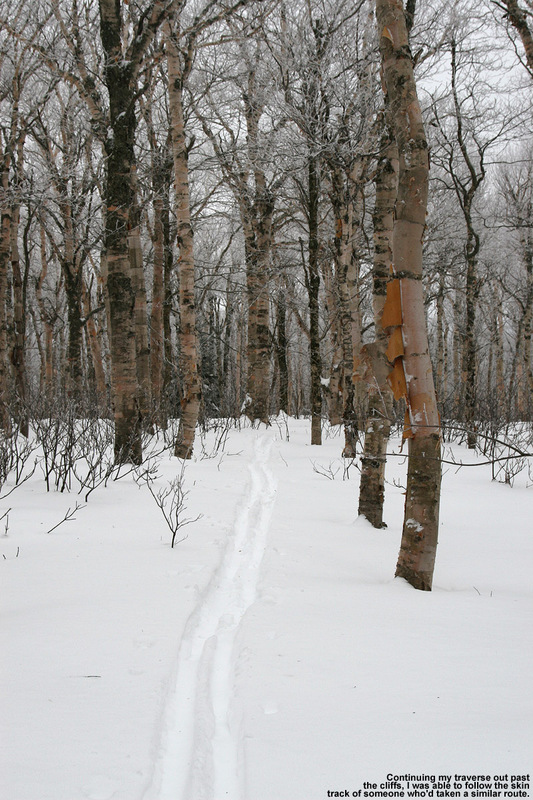 Just as I’d experienced on my last outing in the area, from the bottom of the glades it was an easy downhill ski on the Monroe Trail itself. 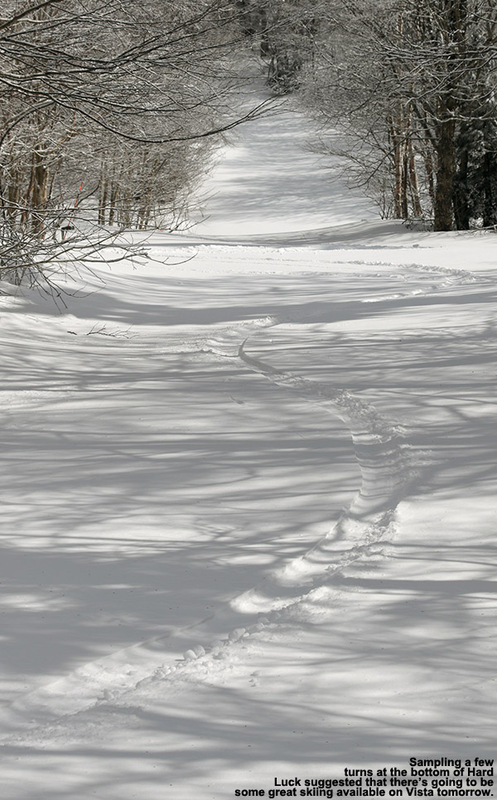 I was even able to catch some turns in the powder off to the side of the snow-covered roadway below the trailhead, then shouldered my skis to walk the last tenth of a mile back to the parking area. The temperature was 31 F just as it had been when I arrived, and the light snow had mostly tapered off down at that elevation. 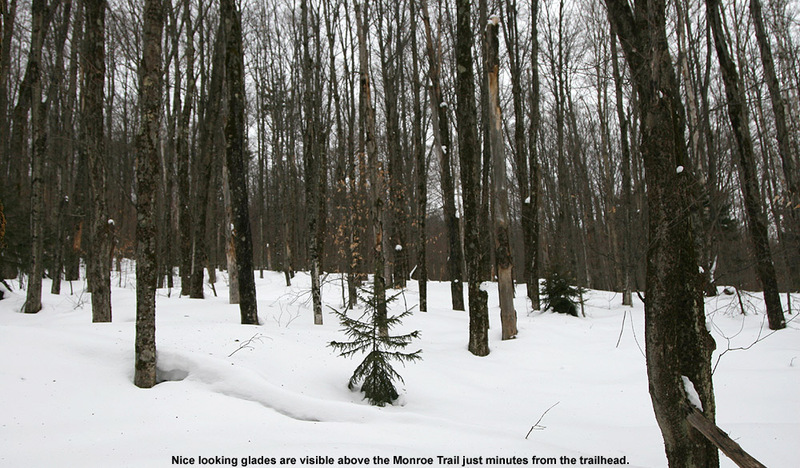 Despite the deeper snow and lack of a defined skin track in the glades relative to the beautifully packed nature of the Monroe Trail, I almost wonder if it’s more efficient to ascend in some cases because it’s a much shorter distance due to the way the Monroe Trail wraps around so far to the south. In terms of preserving the powder and ascending if the unconsolidated snow is deep and there aren’t many descent tracks, the Monroe Trail is the way to go, but now that I’ve gone up via both routes, I’d say they are both pretty convenient options. 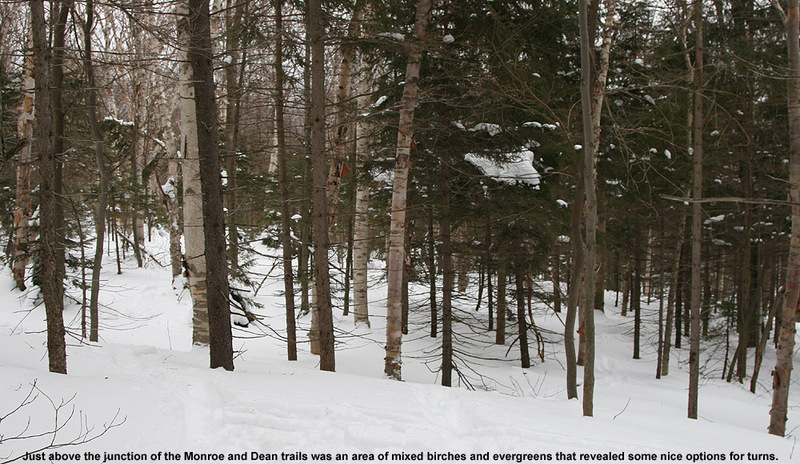 Hopefully I can get E and the boys along on one of these Monroe Trail trips – now that I’ve had a couple of sessions out there, I think I could guide them on a great tour. White tendrils of snow began to appear along the western slopes of the Green Mountains late this morning as the cold air moved into the area, and people started seeing snow all the way down into the valleys. Although the snow from Monday and Thursday only affected the mountains, we picked up our first accumulating snow at the house today as a heavy graupel storm came through in the afternoon. Tonight is supposed to be the coldest of the season so far, and there’s still the chance for a bit more snow before the weather warms up going into next week. 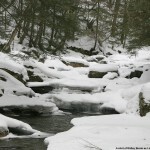 For more information about today’s snowfall, be sure to check out my post in the American Weather Forum. For the full details on this storm, head to the detailed report at the winter weather section of our website. 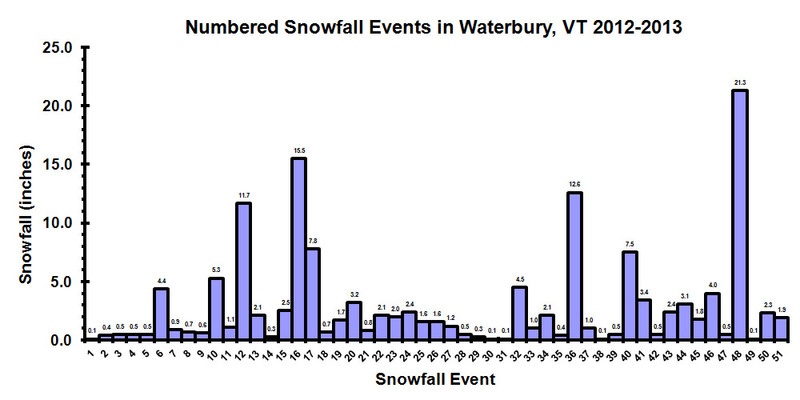 With the warm weather regime we’ve been in over the past few weeks, it’s actually been a month since I’ve heard of any snow in the Green Mountains – September 16th was when we had that cold shot that produced some flakes. 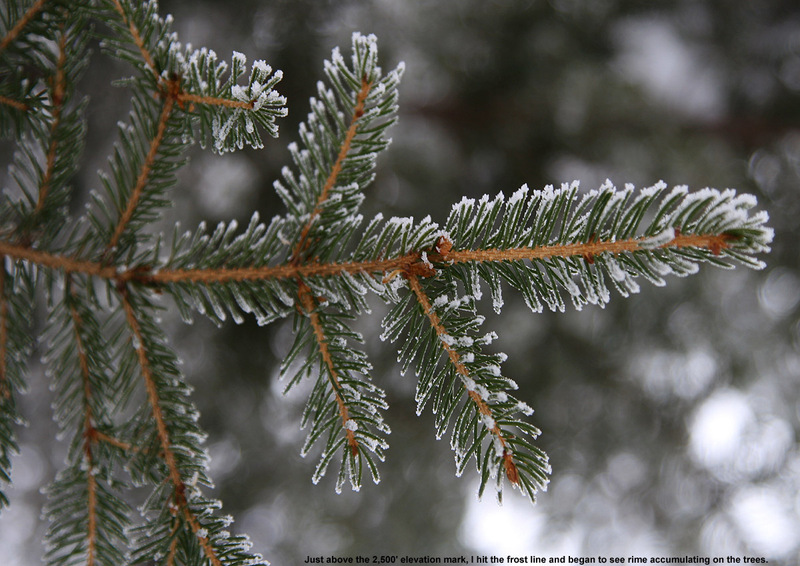 We saw some frosty nights at the beginning of the month, but there was no precipitation with that cold air. However, new reports of snow have been coming in today. Over at the Americanwx.com New England regional forum, Powderfreak got a report of snow squalls atop Camel’s Hump, there was a report of various forms of mixed precipitation on Mt. 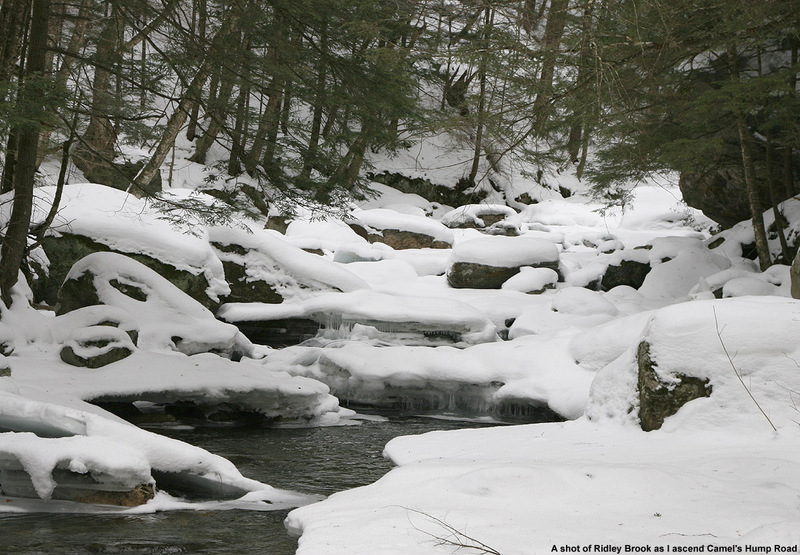 Mansfield, and there was also a report of frozen precipitation from near the Pinkham Notch area over in New Hampshire. Not surprisingly, Mt. 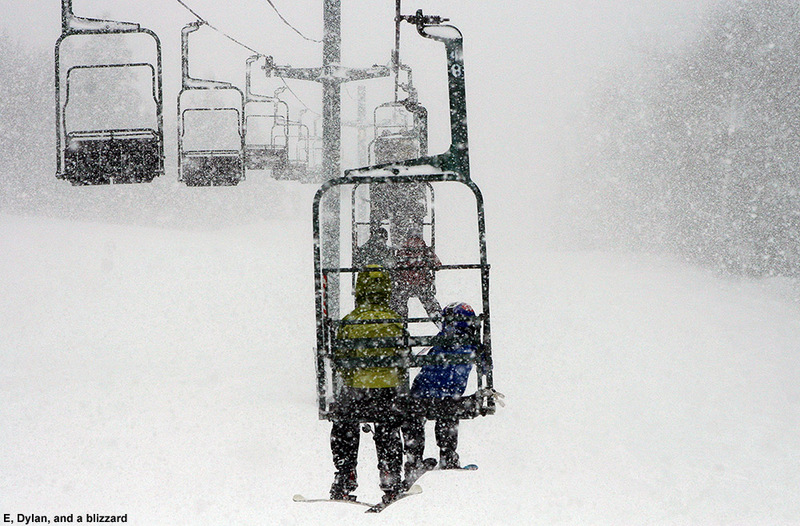 Washington picked up some accumulating snow, with 1.2 inches reported for the day. 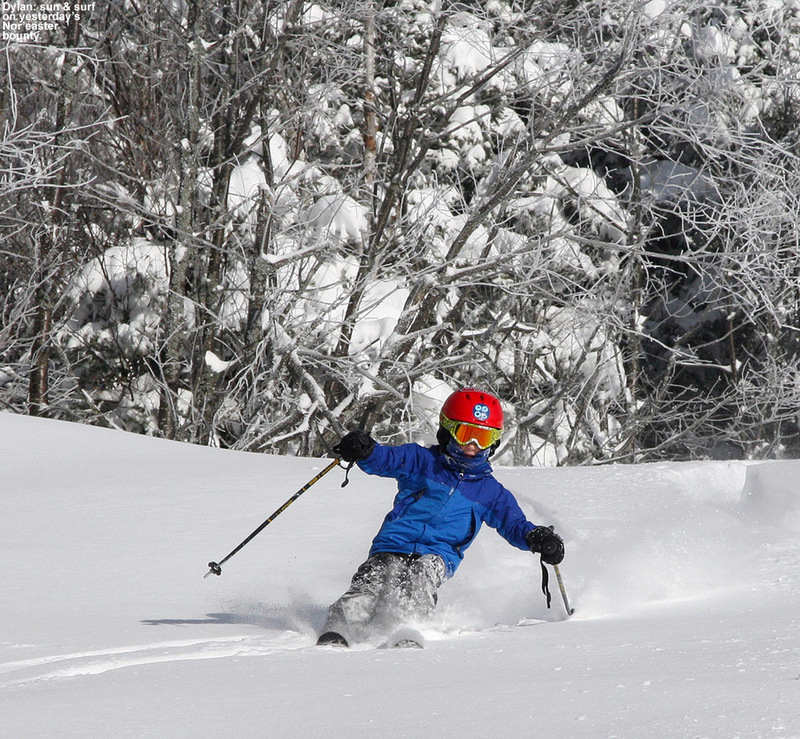 Saturday was another potentially good day for some backcountry skiing in Northern/Central Vermont, since snowfall had again been rather minimal in the area during the preceding week. At the house in Waterbury, we’d picked up just 1.4 inches of snow in the Sunday/Monday range from a storm that favored parts of Maine and Southern New Hampshire with up to a foot, and then 1.6 inches of snow in the Tuesday/Wednesday timeframe from an upper level low coming out of the Great Lakes. As for the mountains, I saw accumulations topping out in the 4 to 5 inch range for the Bolton through Sugarbush stretch, with amounts tapering off to the north. The forecast on Saturday called for a cold start in the 0 F range, but brilliant sunshine and eventual temperatures in the 20s F. Weather wise, it was an excellent time to get outside. 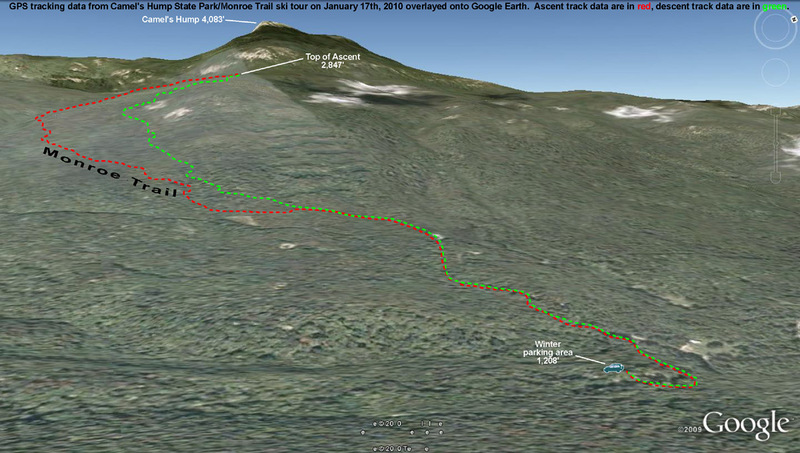 With the snowfall thoughts in mind, the plan was to do some skiing off the west side of the Camel’s Hump/Mt. Ethan Allen area. Unfortunately, on Friday we found out that Tom had tweaked his knee and ankle at soccer, so the ski group for the day was going to be just James, Ty, and myself. We met up with James in Huntington Center a bit after 9:00 A.M., and decided on an initial plan of heading up the Forest City Trail to do some skiing on the lower flanks of Mt. 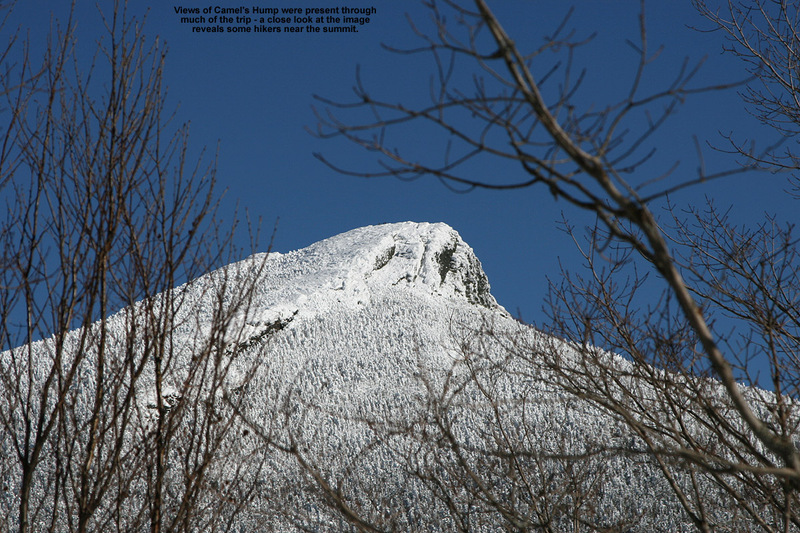 Ethan Allen (3,674’), the next prominent peak south of Camel’s Hump. We headed up Camel’s Hump Road, finding that the access to the Forest City trailhead was going to be difficult because the road there wasn’t plowed in the winter. There was a little room along the snowbank to potentially park a couple of cars, but a more important factor in our case was the added distance to get to the trailhead. 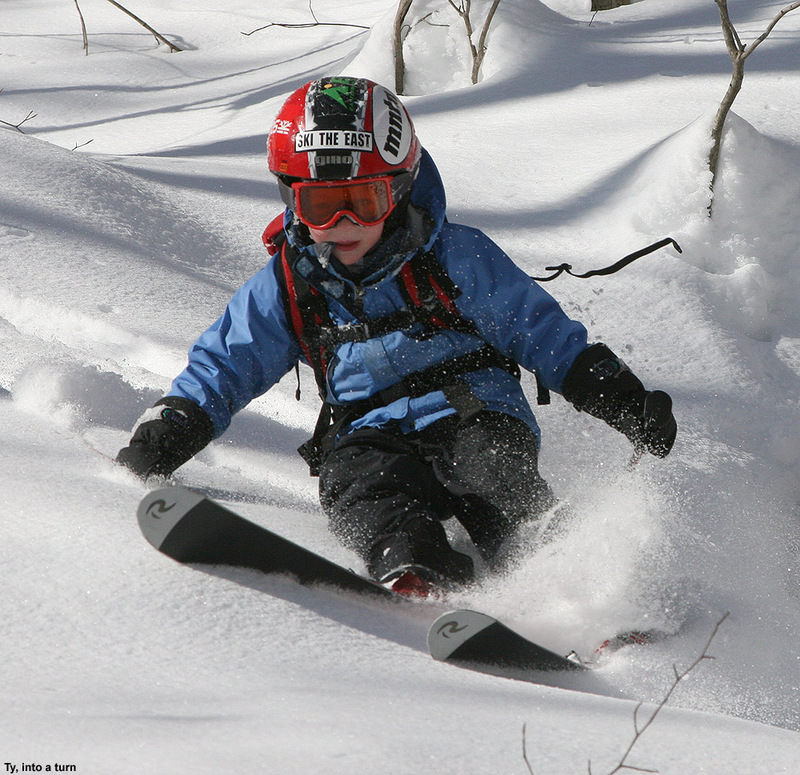 Ty’s backcountry range is not that great yet, so we weren’t looking for a big approach. There was the option to connect over to the Forest City Trail from the Burrows Trailhead area, but we decided to just do something simple off the Burrows Trail. James had commented to me earlier that there was going to be a temperature inversion in effect, and that was indeed what we saw on our ascent of Camel’s Hump Road. From down in Huntington Center (690’) where the temperature was somewhere in the middle single digits, the temperature was up around 10-11 F at the trailhead parking area (~1,900’). The lot was about half full, and while we geared up, we could see that several parties of people were heading out for hikes on snowshoes. Starting up on the Burrows Trail, I checked the snowpack and found a couple inches of fluff on top of a generally thin crust, atop a lot more settled powder. A few of the lower elevation stream crossings on the trail were open with small gaps, and that represented a bit of a challenge for Ty, but he managed well. 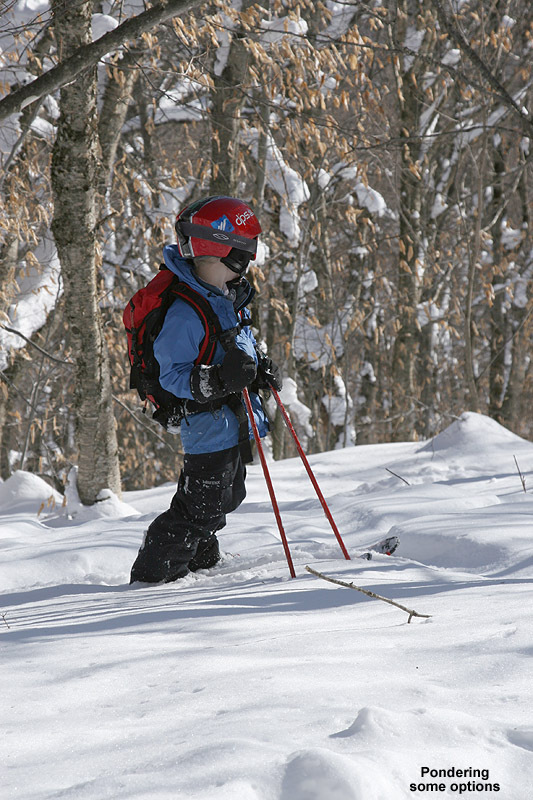 We didn’t have any lofty goals in mind other than getting in a little skiing, since our ultimate destination would likely be affected by Ty’s mood and stamina. Our pace was pretty slow with Ty taking his time, but it was an easy go, and everyone’s skins were working well on the packed trail. There were lots of dogs, lots of people on snowshoes (including a bigger group that seemed to be from the UVM Outing Club), and we also saw a party of about four skiers that passed us on their way up the trail. One of the more interesting sights was a woman coming down trail at breakneck speed on a sled that looked like a booster seat. We made sure to move out of her way, but she seemed to be very conscious of the uphill traffic and stopped easily. 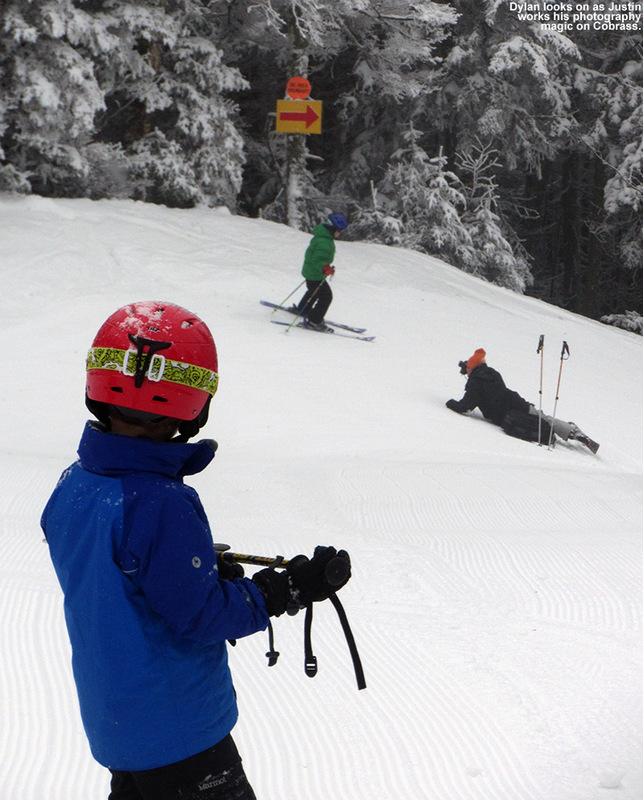 James inquired about how her sled worked, and she demonstrated that for braking, you just lean back. I know that people like to use those Mad River Rocket-style sleds on the trail and elsewhere, but this was the first time I’d seen what this woman had. Ty and James ascend Bald Hill. Up to about the 2,300’ elevation mark the surrounding vegetation was on the brushy side, but above that point it began to thin out and the potential for skiable lines looked a little better. Off to our right, we could see some open, moderate angle slopes across the big gully that had begun to parallel the trail, and off to the left we could see the more obvious lines that steepened on the way up to Bald Hill (3,041’). 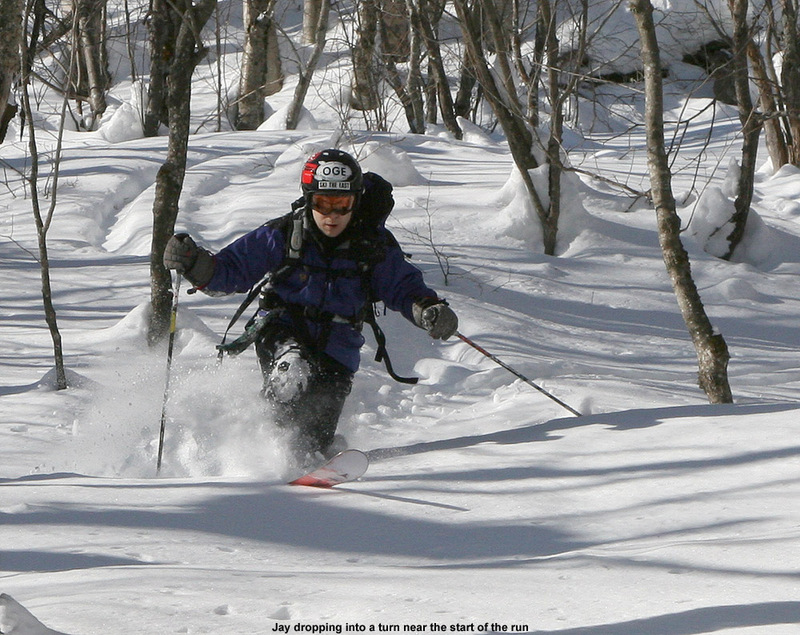 Ty had some good bursts of skinning speed when we kept him motivated, but as inquiries about how far we were going and when we would get to ski became more frequent, we decided it was time to think about our descent route. Heading off to the left for the lower slopes of Bald Hill was going to make things easiest for getting back to the trailhead for Ty, so a bit above 2,500’ when we hit one of the skin tracks breaking off the Burrows Trail and going in that direction, we took it. The change of scene was enough to keep Ty motivated for a little bit longer, since we were able to tell him that we’d be able to descend soon. We headed up into the glades a little farther, reaching an elevation of about 2,700’ before Ty seemed to be getting just a bit too antsy. There were plenty of good lines available with untracked snow, but we could see that taking them would mean dropping right back down to the Burrows Trail almost immediately. 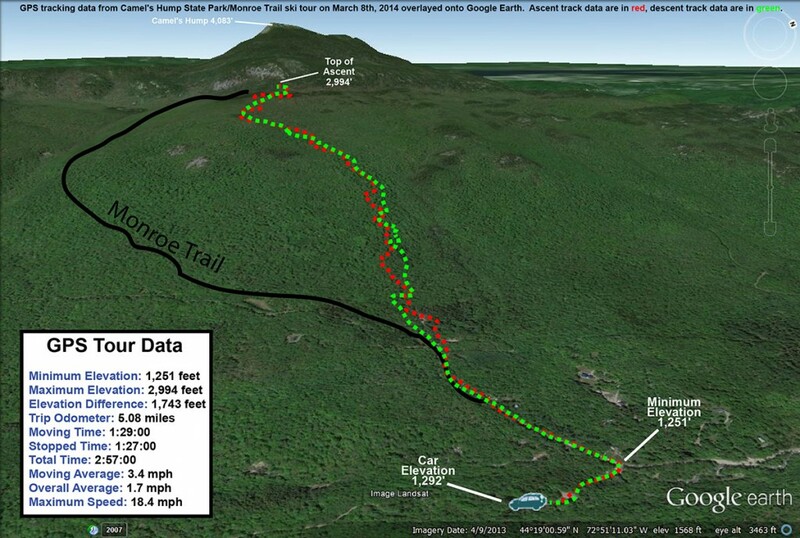 So, we continued to contour westward to get something that might drop a little more directly to the trailhead. 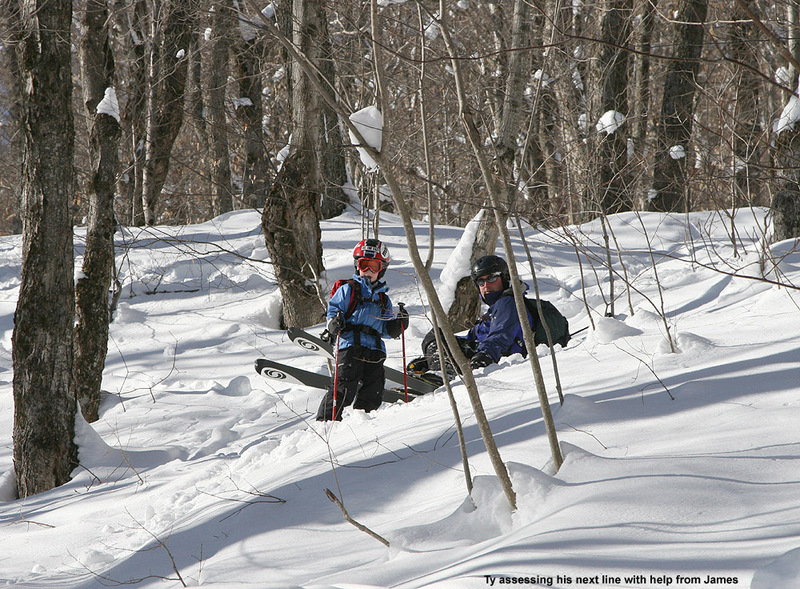 We could only traverse so far though, since Ty knew we were close to skiing and his inquiries started up again. When we finally called it on the traverse, James and I skinned up a little farther to catch a nice looking line, while Ty waited just below us. 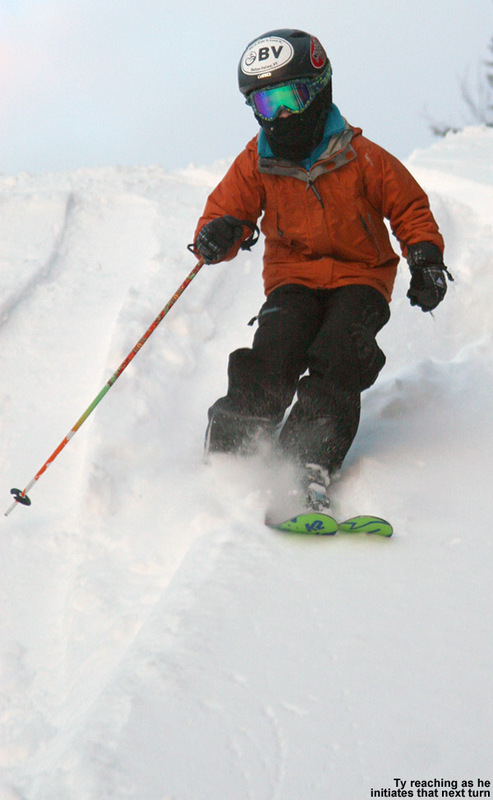 Jay enjoys some turns in the beautiful powder out there on Bald Hill. The skiing was good, and definitely worth the hike, but certainly not perfect or quite up to what I’d found off the Monroe Trail the previous weekend. The combination of settling and the thin breakable crust in some spots made things tricky at times, but it was all soft and fun. Ty stuck with just alpine turns, but had a lot of fun catching air and working on his jumping technique. Our extra traversing had bought us a little longer descent, but we still dropped back to the Burrows Trail pretty quickly. Instead of trying to ski on and near the trail, we took a traverse out to the west with the aim of eventually dropping back down to the parking lot to finish our run. I used the GPS for route finding, and as is often the case, James went by his natural sense of direction. The biggest issue with the traverse was that like on the Burrows Trail itself, a few streams were still open from the previous warm weather. 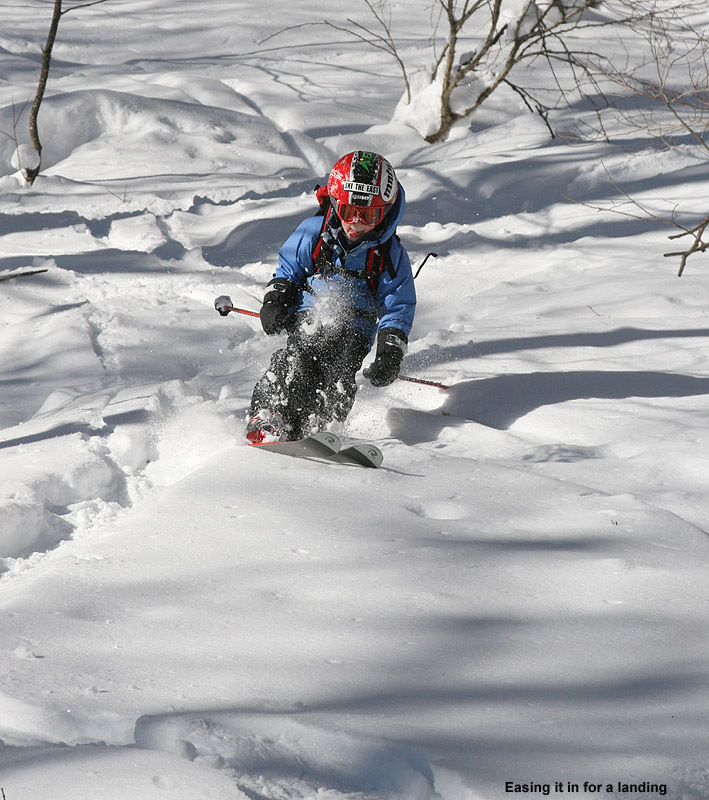 They weren’t too hard to cross since there were still snow bridges around, but Ty’s smaller skis definitely set him at a disadvantage for spanning some gaps. We helped him across when needed. Even with the aid of the GPS, I overshot the parking area by about 100 feet or so and had to swing back during my final descent, while James nailed it right on. 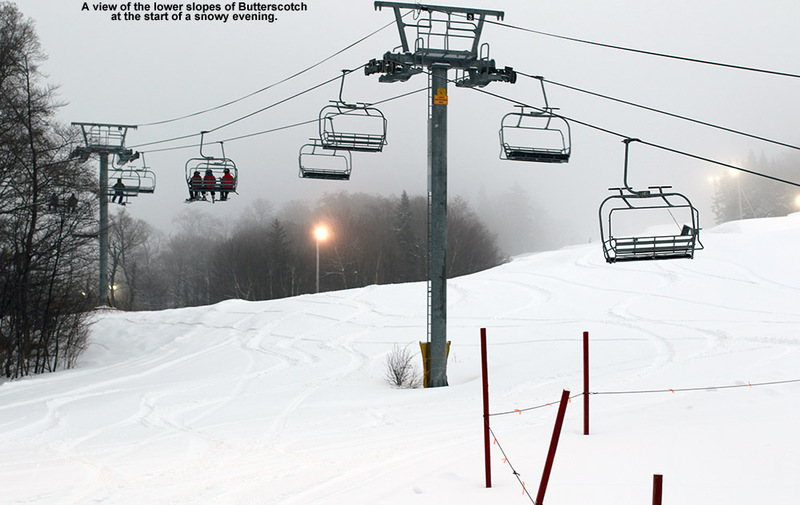 From what I’d been hearing, ski conditions were generally decent around the area this week, but new snowfall was sparse. Subsequent to the 9 inches of snow that Bolton picked up last weekend, they’d only reported 2 to 3 inches of additional accumulation. Down at the house in Waterbury (495’), we picked up 4.8 inches of snow from that weekend event, and then smaller events on Monday and Wednesday dropped 1.2 inches each. It was enough to keep things fresh, but it was rather dry snow that probably didn’t add too much new substance to the snowpack. The end of the week also saw an increase in temperatures, with our location in the valley getting up to around 40 F at times. It was a little hard to get a sense of what had gone on with the weather in the mountains, since I heard talk of a crust in the Mt. 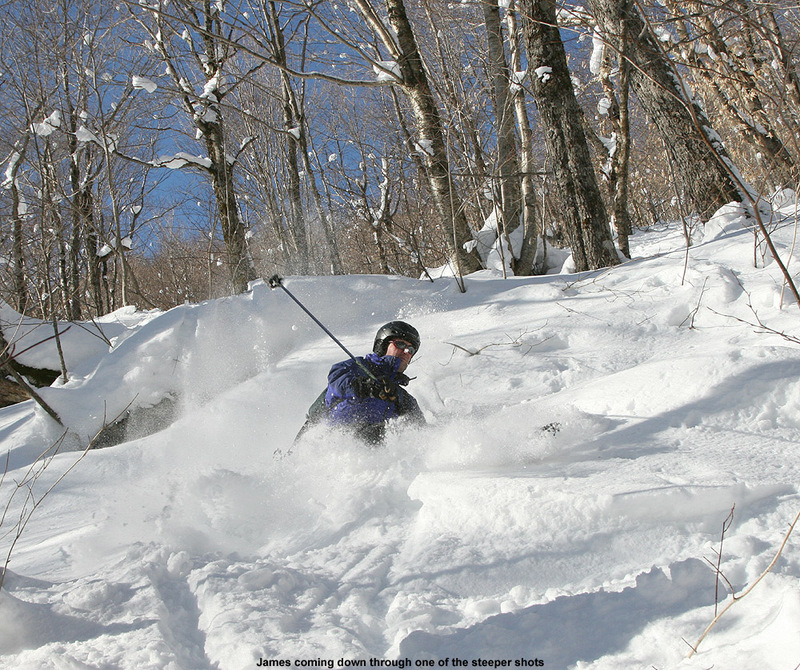 Mansfield area, but Paul Terwilliger’s report from Central Vermont suggested that the powder was great down there. Unsure of whether I was going to encounter, powder, crust, mush, or who knows what, I chose to keep it simple and earn some turns close to home. I decided to check out some terrain right across the Winooski in North Duxbury below Camel’s Hump. 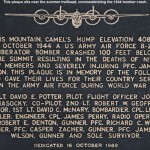 From the Winooski Valley, at an elevation of about 400’ or so, the Camel’s Hump Road heads southward up into the mountains for several miles to an elevation of about 1,500’ where there is access to Camel’s Hump State Park and various hiking trails. My friend Weston used to live right up near the top of the road, and told me that there were plenty of glades up above him along the route to Camel’s Hump. 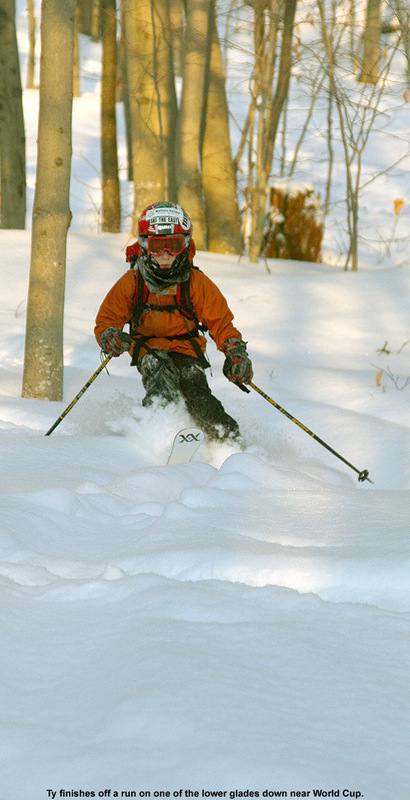 I took a peek at my copy of David Goodman’s backcountry skiing book for Vermont, and he also speaks of the various glade skiing options along the Monroe Trail. This was actually my first time driving up Camel’s Hump Road in the winter, so it was neat to get the perspective with the snow. The drive offered great views of Ridley Brook, which flows near the road throughout the drive. I always get a kick out of some of the funky houses along the road: some that seem to be accessed by unique bridges, and others with their own quirks, like one that seems to be some sort of partially underground structure with a flat roof. At this time of the year, the very top part of the road is closed, so I had to park in the winter parking area at ~1,200’. From a temperature of ~38-39 F down at the house, the temperature dropped to ~36 F at the parking area, and in terms of snow conditions, I hoped that the temperature would continue to drop as I ascended. With skins on, I quickly made it up the rest of the snow-covered road to the main parking area and trailhead at around 1,500’. 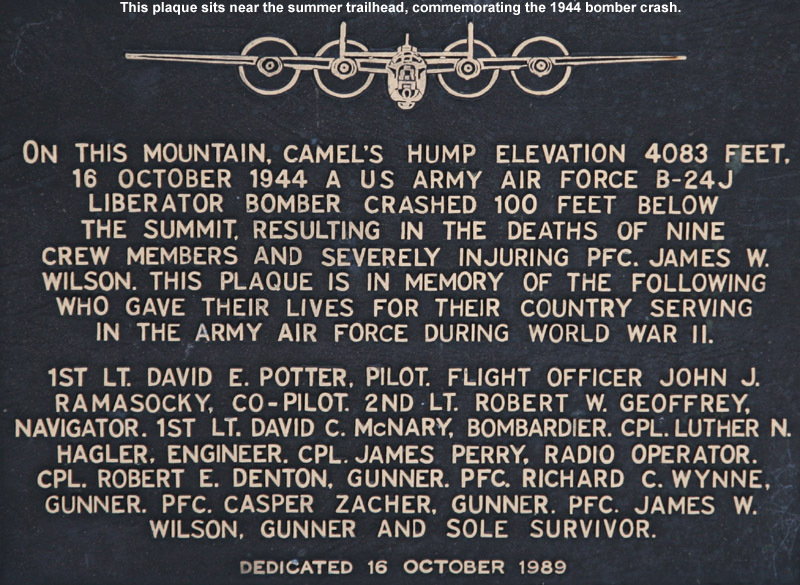 I checked out the plaque near the trailhead commemorating the 1944 bomber crash on the mountain, and then I was on my way up the trail. I began checking the consistency of the snow, and it seemed like the powder was dense, but not really wet, and there was no detectable crust. 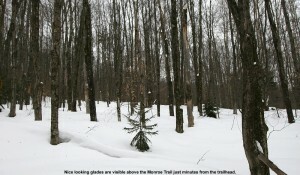 Within a few minutes of being on the Monroe Trail, I began to see obvious glades up above me as Weston had suggested. The Monroe Trail didn’t really attack the fall line, instead it seemed to gradually contour up and to the left in a southwesterly direction. I figured that one approach to skiing the glades would be to see if I could gain some elevation on the Monroe Trail and eventually traverse back in a northeasterly direction for a fall-line style descent back to the trail, but I wanted to see where the Monroe Trail would take me on its own before I started breaking snow on a new route. The trail was well packed, and plenty wide as David Goodman suggests in his book, so it’s really easy to cruise along with skins. I was happy to have full-width skins in a few spots where the trail gets steep, but one could certainly make due with less as long as the snow consistency supported good grip. 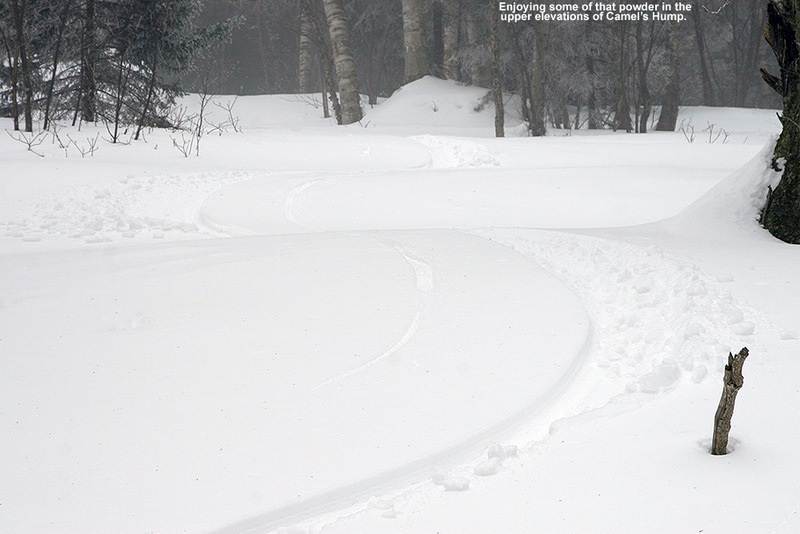 There were a few ski tracks where skiers had come out of some of the glades, and tracks suggested that a few more folks seemed to have skied on and around the trail, but I didn’t see any skiers during my tour. 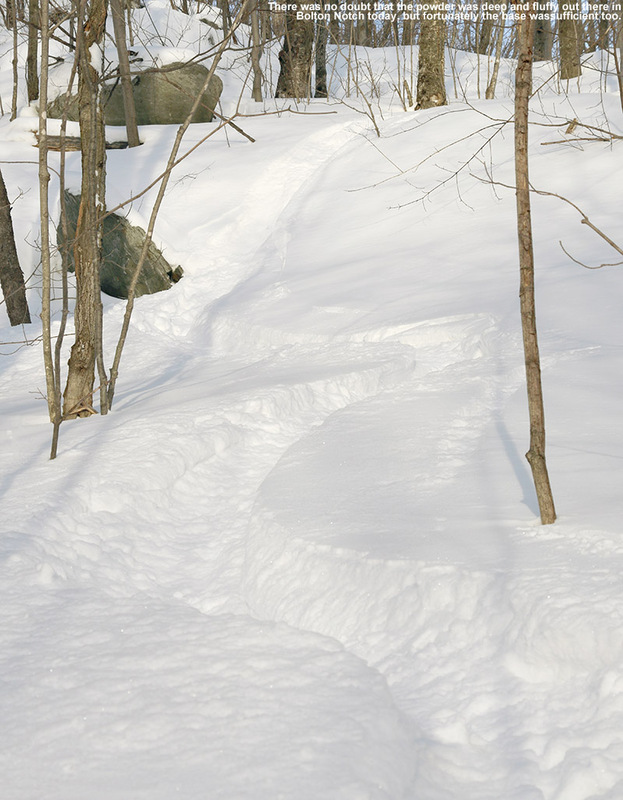 I did see a lot of people on snowshoes: one group of 6 to 8 people, a few couples, and a couple of other groups. The trail continued it’s mostly gradual, southwesterly ascent, and at around 1,800’ I noticed that the trees seemed to have more brush in them than I’d seen in the earlier part of the climb. 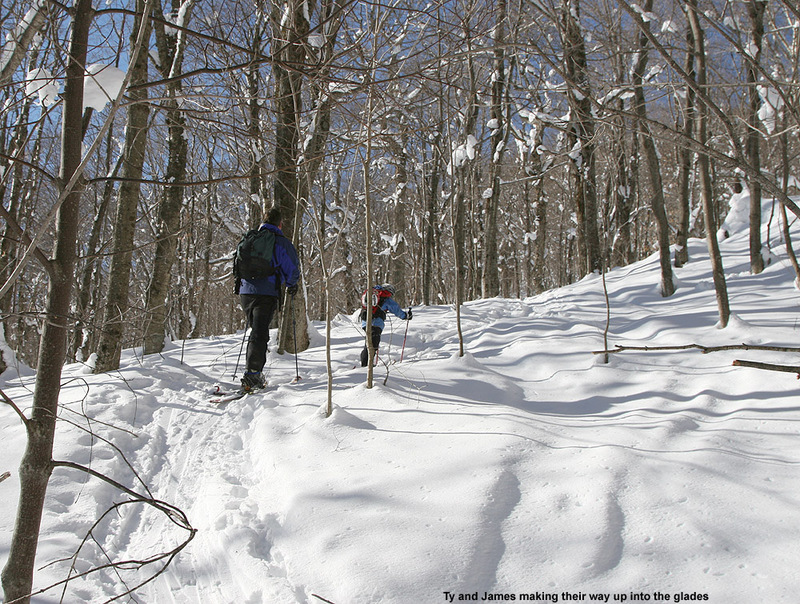 At 2,300’ in elevation, I reached the junction of the Monroe and Dean Trails, and direction-wise, continuing on the Monroe Trail was the obvious choice for what I wanted to ski. The Monroe Trail had been starting to wrap around toward a more northwesterly direction, getting more in line with my efforts to eventually head to the northeast, while the Dean Trail headed southwest. Not far above the junction, the forest began to turn into a beautiful combination of birches and evergreens, and I could see some nice ski lines for folks that opted for the skiing in the trail area. Then, a little above the 2,500’ elevation mark, I hit the frost line and everything began to turn white, changing the look of things again. Ascending farther, the forest transformed back into more hardwoods again with some decent open ski lines paralleling the trail, and I could see that a few people had used them. 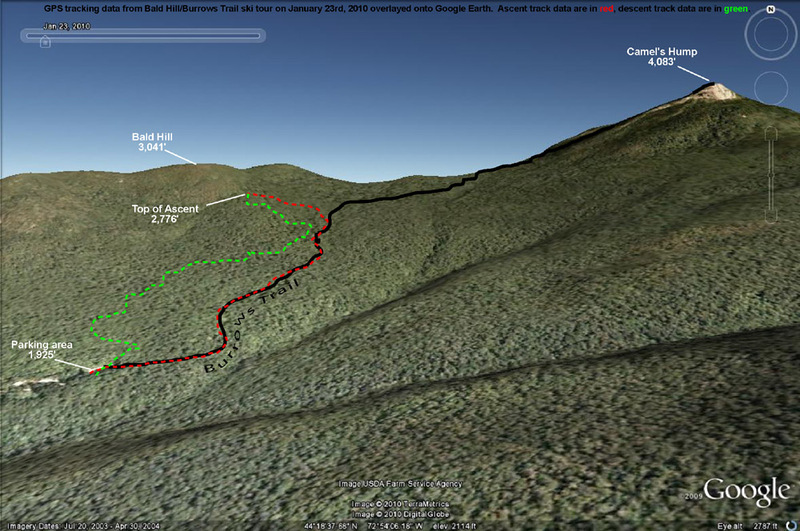 Finally, as I approached the 2,800’ level, the trail was actually starting to almost make a north/northeasterly jog and far above I could see huge cliffs on the eastern face of Camel’s Hump directly ahead of me. 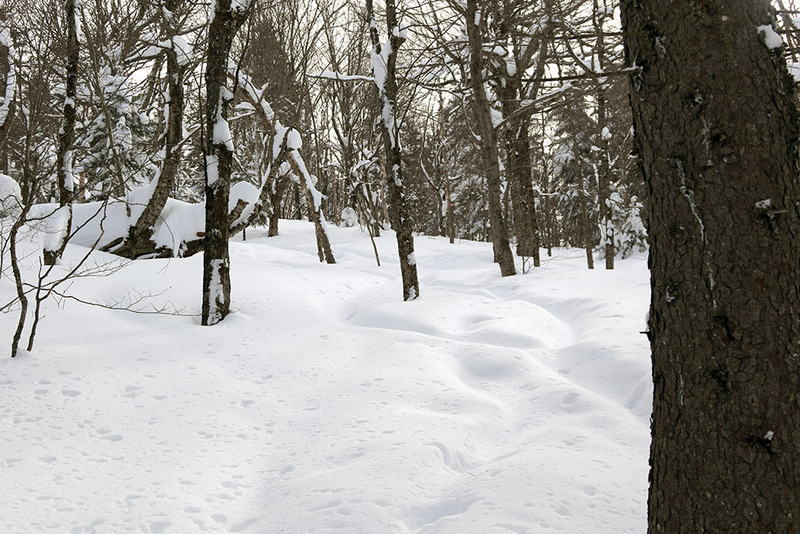 The forest quickly transformed yet again into an area of almost exclusively evergreens. It was after 3:00 P.M. by that point, and as I didn’t want to push the available daylight, I began to look for the best route to traverse northeastward for my descent. I followed the Monroe Trail for as far as it seemed to jive with my plan, and when it really seemed to head southward I had to begin my traverse. I traversed north/northeastward among the evergreens, and down below the cliffs the trees were often quite open. If the snow was elevation-dependent, or if one wanted to simply stick in this terrain, I could easily see this area being used for some great laps of skiing. 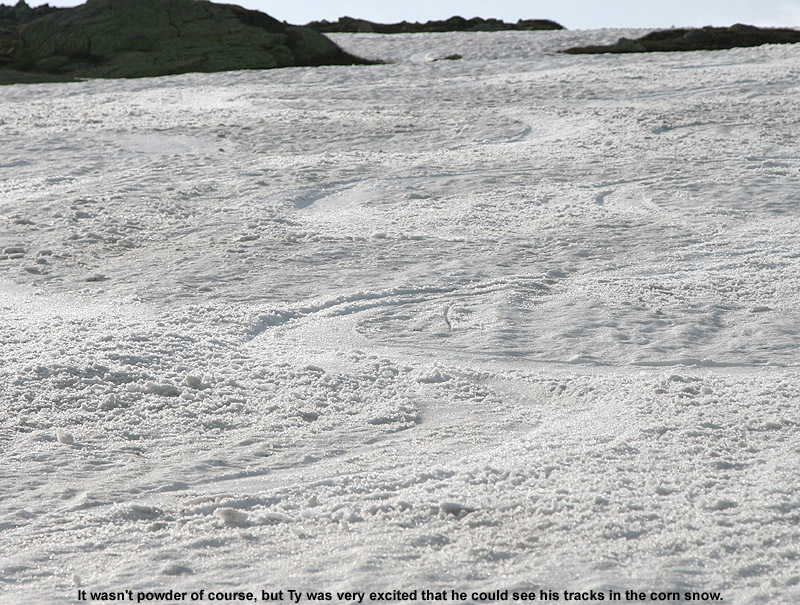 Indeed, I saw various tracks of previous skiers scattered around, suggest that folks had had some fun. As I made my traverse through the evergreen forest, I came across various tracks of people that had either been descending or ascending, but I eventually picked up a skin track that seemed to be very much in line with my plan. I followed the track through the evergreens until it broke back out into a lot of birches, crossing what looked like an interesting trail marked with blue flagging tape. That blue-flagged route looked intriguing, but it ran literally perpendicular to where I wanted to go, so I had to pass it by and chock it up to future exploration. I checked several times with my GPS compass to ensure that the track I was following was legitimate, and not something left over by somebody that had simply been lost, but it stayed on course. After another couple of minutes of traveling through some flat, very open terrain, I noticed that the skier/rider before me had started to make a couple of turns, so I decided it was time to take of my skins and focus on the descent. 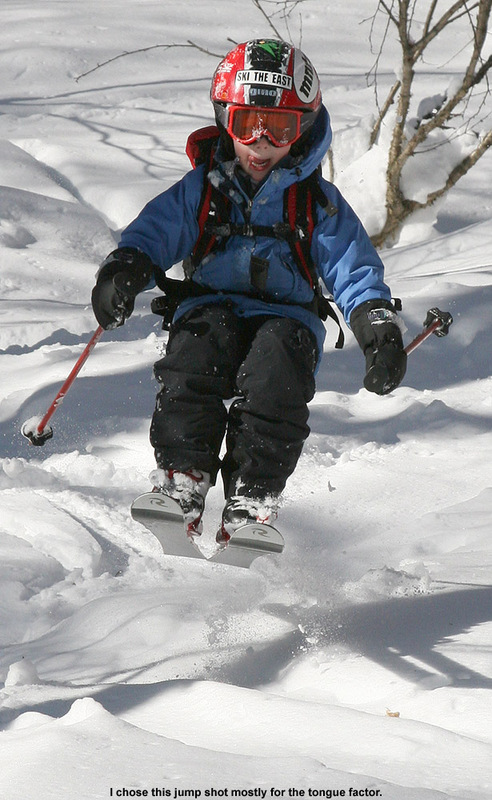 I was excited about the skiing prospects, even if only due to the snow depths and consistency I’d see on the ascent. I had little idea about what I might find for slope continuity or vegetation below. In terms of snow quality, there had been no sign of a crust aside from a couple of isolated spots that had a thin coating that must have been from the sun. And, throughout the trip I’d been checking on snow depths, finding anywhere from 14 to 26 inches of settled powder atop the base snow. 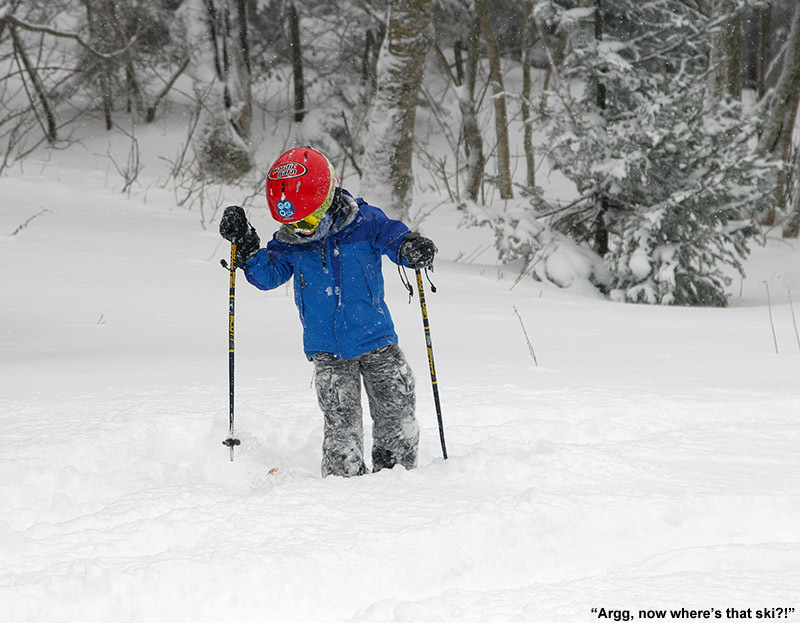 So, both the base and ski conditions in the Monroe Trail section of Camel’s Hump State Park were great as of yesterday at all elevations I skied off piste (1,500’ – 2,800’). We picked up 1.4 inches of snow from last night’s activity, so that area should have picked up something in the 1 to 3 inch range as well, and I can’t imagine that would be anything but a positive on top of the conditions I experienced.